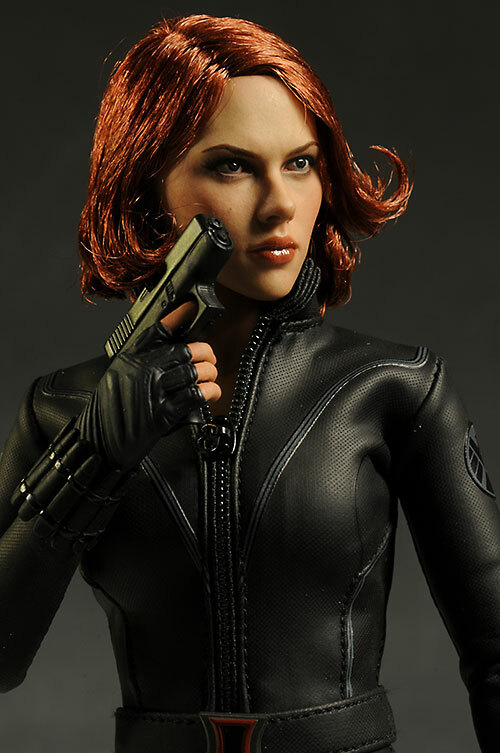 While I love just about everything to do with The Avengers, one of the best aspects was the personality and character of Black Widow. They gave her enough to do, and provided her with terrific dialog and attitude. From now on, every superhero movie just needs to be handed over to Josss Whedon. 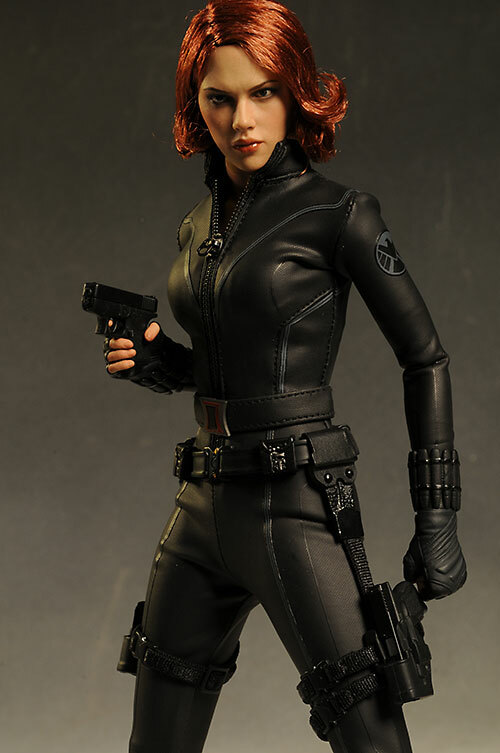 Hot Toys did a Black Widow figure based on the original appearance in Iron Man 2, and of course I reviewed it back then. 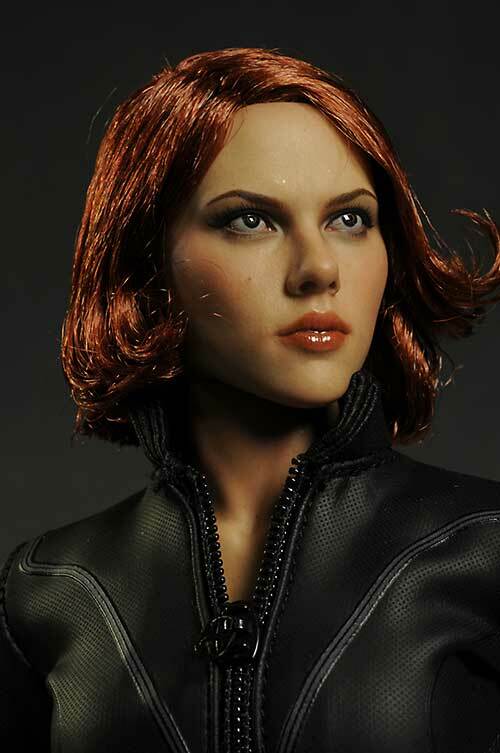 They've recently released the new version, done up to mimic her look from The Avengers. This figure has been shipping internationally for awhile, and will cost you around $190. There's only one version this time - no exclusive. While there's always questions about every figure, with one like this the most obvious is "I have the first - do I need the second?". Let's see! 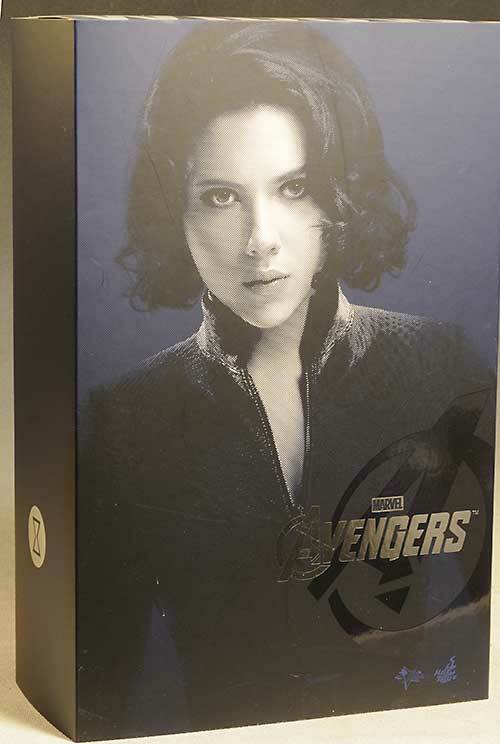 A low score from me for a Hot Toys package, but this one is really basic. There's merely the outer slip cover and an inner window box. A couple plastic trays to hold everything, and that's it. Everything is collector friendly of course, but this is about as basic as you can get. 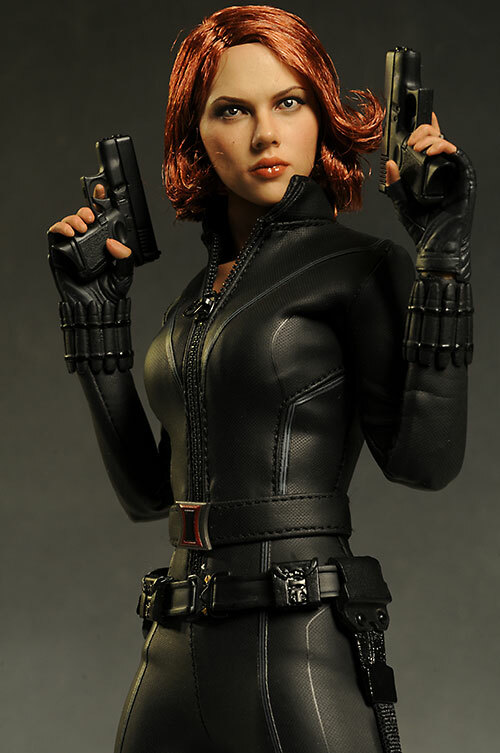 Scarlett Johannson is a truly beautiful woman, and we all know how difficult it can be to capture that sort of beauty in a static sculpt. 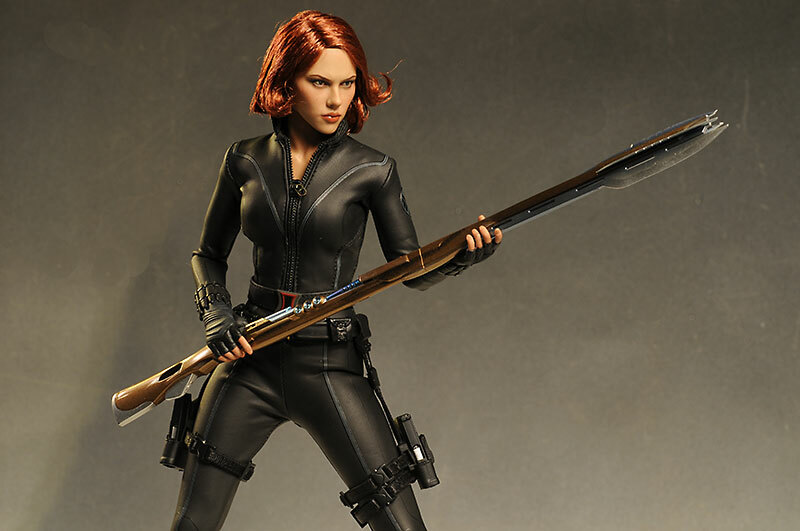 It is difficult, but that doesn't dissuade the folks at Hot Toys. That's a good thing too, because they've managed to do an amazing job. She has a slightly sultry look, with just a smidge of grim determination. It's an almost neutral but not quite expression that works very well for this character. They went with rooted hair again, and it works relatively well. It's a shorter cut this time, just like in the film, and they've hit it very hard with the gel. It's stiff, making it tough to mess up - assuming that the factory worker that did the styling knew what they were doing in the first place. The female base body they are using is slightly smaller in stature and build than the first release. She's about 11" tall, and I think the scale is actually more accurate this time around. After all that praise, there still is a minor issue, at least for me, that holds it back from a perfect score. I can't quite put my finger on what it is that causes the issue, but she still has a bit of a mannequin appearance, sort of like a wax model. She doesn't quite have that spark of life, but far be it from me to know exactly how to fix it. Hot Toys + paint = ****. That seems to be the formula these days. I will make a small caveat however. While there's no doubt this is an amazing paint job, especially around the lifelike lips and beautiful eyes, the skin tone doesn't quite have the same realism as the male characters. I'm not sure why that is, but it's worth noting. Usually I'd rave about the hair work here as well, but with the rooted style, that's not relevant. This female body works extremely well, with a ton of great articulation that allows the figure to take plenty of flowing, natural, feminine poses. The ball jointed neck - one of my favorite articulation points - works terrific, and the soft body suit is much less restrictive than past designs. In fact, this was almost a perfect score, and I suppose you could argue that even with my one nit, it still is good enough to deserve the full four stars. What is that one nit? The ankles, of course. We have some serious boots here, with platform heels and all, and while they are somewhat soft around the ankles, you still can't get much movement. That reduces the depth of her stance somewhat, and doesn't allow her feet to remain flat at all times. The use of the two piece boots by Sideshow is starting to spoil me. There's not a ton of stuff here, especially considering the price. She has some key items, like 8 different hands to work with the weapons and some specific poses. They swap easily enough, and two of them are designed with the blue 'tazer effect'. 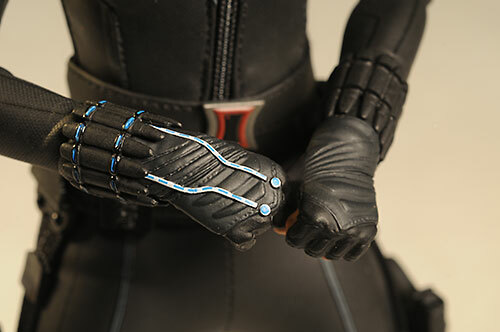 These hands are intended to go with another one of the extras - the highlighted stinger bracelets. You can swap the basic black set for these, assuming you're using these extra hands. There's extra pegs for the hands as well, as you've come to expect. Likewise, there's a basic display stand. 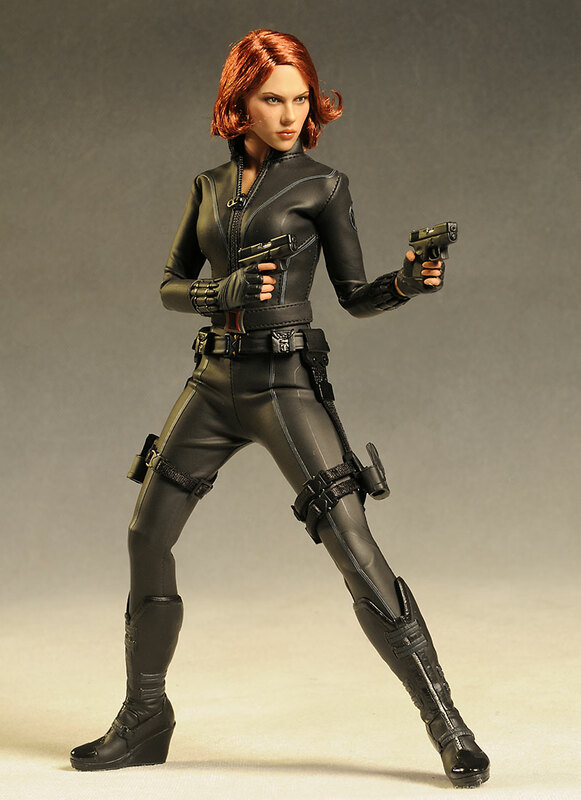 Black Widow has two pistols that fit nicely in the holsters on her hips. They have moving slides (with an actual spring action! ), but I am unable to get the magazines out. They're supposed to come out, so perhaps you'll have better luck. She also has two of the small discs, and these go with a specific hand to hold and throw. Finally, the most wanted accessory is the alien blade/rifle. This fits in nicely with the whole Avengers line, and looks fantastic. I'm betting some folks will be picking this figure up largely because of this one accessory. The tight body suit looks fantastic, with a relatively well scaled zipper, clean patches and stitching, and fantastic tailoring. Better still, it doesn't restrict the articulation the way the previous outfit did. There's also a cool holster and belt, which fits great and holds the guns at just the right height for easy access. The boots might be a bit restrictive, but they are gorgeous, with a terrific sculpt and nice gloss finish in all the right places. Obviously this one isn't for the kids, but adult collectors will have a great time posing and displaying this babe. The price on this lovely lady is running $175 to $225, widely varying based on the seller. This is a very popular figure, and has sold out at a number of places already. Unfortunately, I'm not sure she's really worth that kind of cash. There's not a ton of accessories here, and the outfit isn't nearly as complicated as some. There's a couple different ways to swap the hands, and each works better in one way than another. The issue isn't around the hands themselves - they swap easily enough. It's around the stinger bracelets on each arm, which get in the way. You can push the bracelet up the arm further, swap hands normally, and then bring the tips of the bracelet down over the edge of the hand. This is the trickiest, and you can damage the tips if you're not careful. Another option is to remove the bracelet, place it higher on the hand, pop the hand on and then slide the bracelet down. Finally, you can remove the wrist peg as well, and put the peg and bracelet on the hand first, then pop them onto the arm. I figured this would work the best, but found that the wrist pegs fit very tightly into the arms, making this trickier than you'd expect. For me, the second option worked best, but your mileage may vary. If you don't have the original version, then this one is the one to get. It's an improvement across the board, and even those with the first Widow will be hard pressed to pass her up. Unfortunately, there's that small issue of her price. 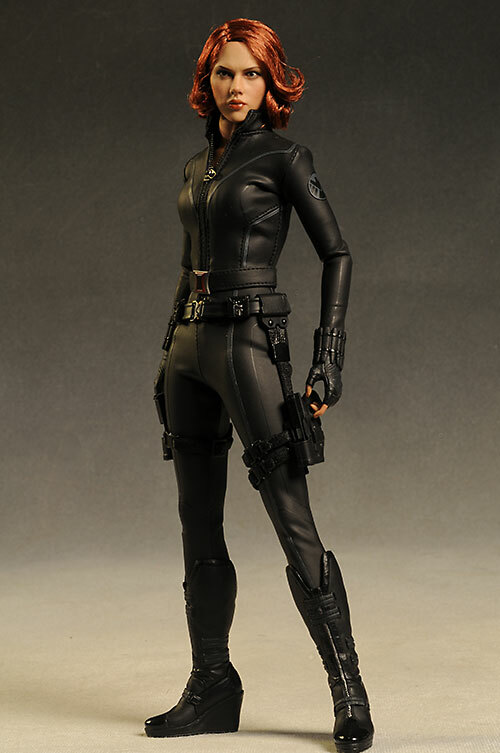 Regular readers know I've been concerned about the rising cost of basic Hot Toys figures, and Widow is another excellent example. There isn't anything here that should put her over $150, and the first version was only $135. Even with inflation, there's no reason that this time she should be close to $200, and this is easily her biggest flaw. Still, it seems that Hot Toys fans are finding a way to ignore the exponentially rising prices and still buy the figures they love. I'm betting the Widow will be high on most want lists, and once she's sold out the secondary market prices will find a way to rise. - is at a whopping $240. 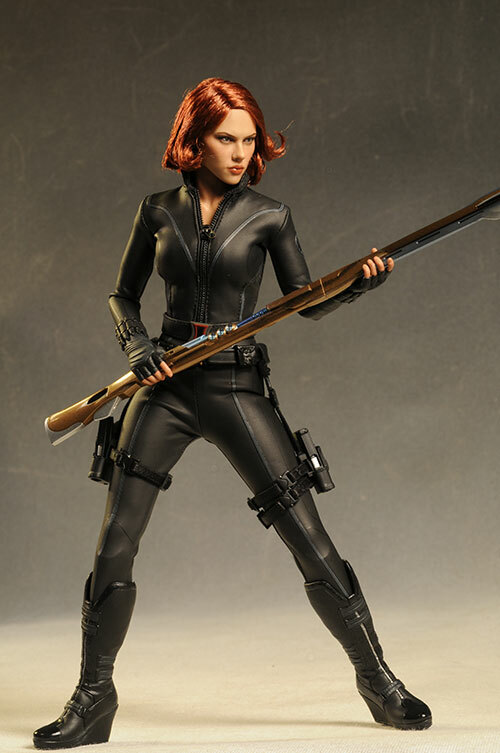 Other key Hot Toys Marvel figures include the recent Iron Monger, Hawkeye, Nick Fury, the Mark V, the Secret Project version, the MKVI, the very cool War Machine, their first Black Widow, Whiplash, the Mark III figure, Mark II figure, Mark I figure, and additional Tony Stark men's suit. There are also guest reviews of the Battle Damaged Iron Man and Mech Suit Tony Stark. This page copyright 2000 - 2017, Michael Crawford. All rights reserved. Click here for copyright permissions!